I got my first tablet. 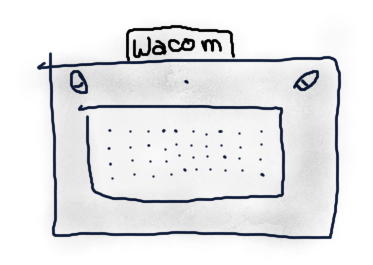 I got the Wacom Intuos Photo. Basically, what tricked me was it was on sale, haha! After so many years, I got it. But the most funny part is that when I noticed it was on sale, I debated myself for 2 hours to convince me or not to get it. After all, I’d get clothes or a haircut later in this year, but who knows if I could find this tablet at a better price! I didn’t hesitate to get it since it was inside of a Mac Store. Honestly, I was going for a case for my MacBook Pro but I found out the tablet, instead. Plus, they didn’t have aqua cases. There were several editions for this tablet but it seems that it is the software gift what changes, ones had sketch software, others creative software, others design, comic creation, note taking, and the mine has something with photos. Even though I plan to use SketchBook and AutoCad, Intuos Photo software comes in handy since I have +15k photos in my cellphone. My plan was to start drawing something cute but since I updated this thing to High Sierra, it takes ages to start and more to install a program. ERES MODELO, ATLETA, COCINERA, COACHING EMOCIONAL, ¿TE DEDICAS A LA INGENIERÍA CIVIL O AHORA ES TEORÍA DE PARTÍCULAS? Siempre es Ingeniería Civil. Creo que la confusión vino porque estaba estudiando la cinética, cinemática y vibración de partículas, que son temas ofrecidos en Mecánica de los Sólidos 2, que es una materia incluida en el pénsum de Ingeniería Civil.